Children’s play is a subject that has all but disappeared from the policy agenda since 2010 – other than as a target for cuts and privatisation. Yet the last Labour government led the world by introducing a 12-year Play Strategy for England: an issue that Jeremy Corbyn seems keen to resurrect. A new book by Adrian Voce OBE, describes the policy, what it achieved, and why a new version of it is badly needed. Policy for Play, he argues, should be a priority for the government, not just as part of its anti-obesity programme, but as an integral part of supporting good childhoods. The forthcoming National Obesity Framework, long promised by Downing Street to address the ever-growing health problems arising from poor diets and inadequate exercise, has prompted the All Party Parliamentary Group on A Fit and Healthy Childhood to publish its own report of the same title. Key among the cross-party proposals is a greater accent on children’s informal activity. This would mean making a much bigger priority of their need for time and space to play – freely, in the common spaces and places of a child-friendly public realm. In 2014, the parliamentary group, co-chaired by the former children’s TV presenter, Baroness Floella Benjamin, called for children’s play to be reinstated as a ministerial responsibility and for a new national play strategy to be developed that should include a statutory duty on local authorities to make sufficient provision for play, as is now the case in Wales. Perhaps most surprisingly, the soon-to-be Labour leader Jeremy Corbyn agreed, writing an opinion piece in the Sunday People to highlight his support for the parliamentary report and condemn the Conservative government for its “tough choice” to prioritise corporation and inheritance tax cuts over funding for local authorities’ ‘maintenance or improvements to play areas’. It is true that local play budgets have been drastically reduced since 2010, when Michael Gove’s restructured Department for Education (no longer Children, Schools and Families) sacrificed most of its extra-curricular programmes to shore up the schools’ budget and still contribute to ‘deficit reduction’. 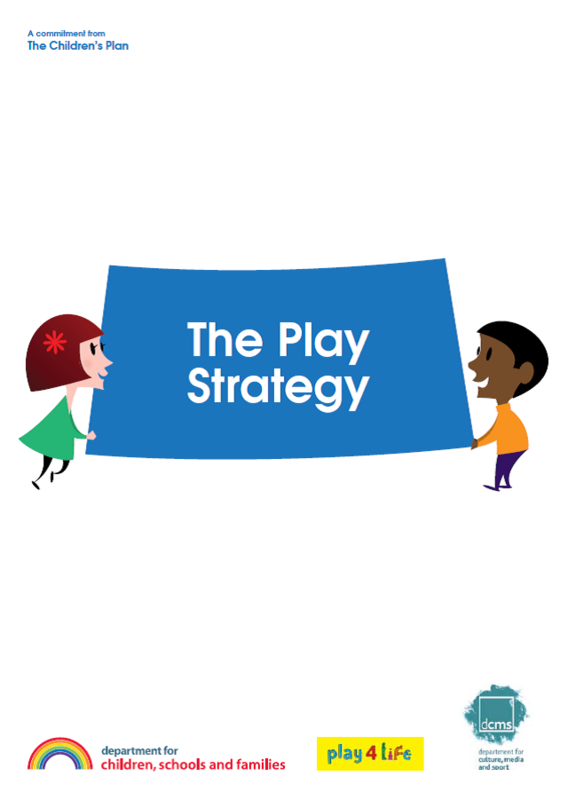 The 12-year Play Strategy(2008) was abandoned and Nick Clegg’s promise of a new Coalition policy for play came to nothing. The abandonment of national policy – and the £400m of central funding, since 2006, that underpinned it – saw play provision become a disproportionate victim of austerity. A report by the Children’s Rights Alliance for England (CRAE, 2014) found that across the 32 local authorities (of 152 approached) able to comply with a Freedom of Information request on play budgets, there had been an overall reduction of 54 per cent between the years 2008-9 and 2014-15. This figure is thought to be widely under-representative of the true picture, with many of the authorities failing to comply because there was no longer even an officer with responsibility for play. Many play services and play areas have consequently been closed or privatised, such as in Battersea Park on the south bank of the Thames, where children wanting to climb and swing in a place that was, for more than forty years, an iconic open-access adventure playground, now have to pay between £18 – £33 a session for the privilege. Yet the Play Strategy was always about more than improving and expanding playgrounds. The bigger challenge was to reverse the modern trend of the ‘battery-reared’ childhood: children confined to their homes, or to structured, managed activities, as the outdoor world becomes increasingly out-of-bounds to them; and formal education concerns itself almost exclusively with their future employability. These phenomena are not the result of inadequate or insufficient playgrounds, but the conflation of a number of long-term changes both to public space and how it is perceived, and to childhood itself, constructed by political discourse and shaped by public policy. Those who applauded New Labour’s ambitions for a more child-friendly, ‘playable’ public realm – and are now calling for children’s play to be revisited as a policy theme – are as concerned that these deeper issues be re-joined as they are that local playgrounds should be better supported against closure. Children’s play is recognised as a human right by the UN Convention on the Rights of the Child (1989) and the UN expanded on what this implies for policy in 2013, when it issued a General Comment calling on governments to elaborate their plans for legislating, planning and funding to provide for it. Pragmatically, though, the bigger driver for a meaningful response is likely to be the health implication of children’s increasing inactivity. Public Health England estimates that a third of 10-11 year olds and over a fifth of 4-5 year olds is now obese. While policymakers focus on how to improve diets and increase formal exercise, studies of the calorific efficiency of children at play demonstrate that freely playing children frequently engage in more intense levels of physical activity than in even the most vigorous organised sports. Unlike sports, however, the activity is spontaneous, for no reward and enjoyed by all children. Thus, children rest and exert their bodies alternately in a self-regulated, natural rhythm over sustained periods. So convinced was he of the physical benefits of free play that Dietz, writing in the British Medical Journal in 2001 about the coming obesity epidemic, opined that the ‘main solution’ was ‘to simply turn off the TV and let them play’. Whatever the incentive to re-establish a meaningful response to children’s need or right to play it will involve taking on a number of long-established policy areas where their needs are rarely considered; and, ultimately, one where they are construed to be less important than – or at best, equivalent to – their future needs as adults. One oft-quoted measure of children’s declining freedom to enjoy outdoor space unsupervised – their degree of independent mobility, or ‘licence to roam’ – has been the proportion of them walking unsupervised to school. A study by the Policy Studies Institute in 1990 found that this figure fell from 80 per cent in 1971 to a mere 9 per cent by 1990 and more recent studies suggest this figure may now be even lower. A policy for play must tackle the causes of this withdrawal. Research perennially reveals that cars, vans and lorries – moving and stationary – are the greatest barrier to children’s independent mobility and the street play that goes with it. Traffic calming schemes alone do little to address the problem. What is needed is a major and long-term rethink of how we conceive streets where people live. The pervading model of roads with dwellings down each side has resulted in whole neighbourhoods, districts and cities becoming devoid of children playing on the pavements or in the ‘shallow sidewalk niches out of the line of moving pedestrian feet’ (Jacobs, 1961), as they had done in previous generations. Street play schemes are a grass roots attempt to reclaim this space from ‘king-car’ but must lead in the longer term to more home-zones, pedestrian areas, and shared space designs – as the norm, not the exception – so that the streets where people live are once again for people of all ages to enjoy, not just for vehicles to drive down. To the extent that planning decisions directly impact on the shape and nature of the built environment and how it responds to people, national planning policy and local development frameworks should specifically identify space for children’s play as a planning priority, while planning guidance for housing in particular should specify minimum standards – quality and quantity – of play space in new developments, such as those produced by the Mayor of London in 2006. A society that proscribes hopscotch, ball games and young people simply hanging out together, while accepting a daily toll of death and injury to children simply trying to get from one side of a street to another clearly has a long way to go to create a child-friendly public realm. A report by Demos in 2006 provocatively suggested that an ASB hotline should be established not for reporting nuisance by young people, but for them to log the many instances where they are harassed by adult society (such as the use of the notorious ‘mosquito’ buzzers) for simply being out in public. This may be a step too far even for a radical like Corbyn, but a successful play policy will need to engender a more sensitive, enabling approach to the policing of children and young people. Increasing the availability and affordability of childcare, not just for preschool children, but those in their primary years too, has been a major policy for successive governments. Labour’s manifesto in 2015 included the promise to ‘introduce a legal guarantee for parents of access to wraparound childcare from 8 a.m. to 6 p.m. through their local primary school’, but since the end of its flagship Every Child Matters policy, much less attention has been paid to the quality of such provision, which too often amounts to children being effectively kept in school for up to 10 hours a day. It was part of the long-term play strategy that ‘extended services’ should contain a basic offer of staffed play provision, appropriately staffed by qualified practitioners. This would entail enriched play environments, including a requirement for outdoor space, and an adherence to the recognized standards of playwork. For most communities, the local school is the greatest resource solely for children. The vast majority are narrowly focused on the curriculum, driven by a policy agenda that prioritises children’s narrowly defined ‘future life-chances’ over their needs and aspirations as people now. At the very least, school grounds are potential play spaces for local children throughout the day, and all year round, but are generally out-of-bounds when lessons have finished. With a more outward-looking, community-focused approach, these under-utilised public assets could become local ludic hubs. This would go a long way towards ensuring all children have somewhere to play near where they live. In the longer-term, a progressive child policy would look closely at the most current research on the nature and significance of children’s play in a range of academic disciplines –from evolutionary biology to neuroscience – and question the narrow, Piagetian basis of much modern educational practice. In these days of seemingly endless austerity for public services, such an agenda may seem like wishful thinking in the extreme, yet it is less than six years since one very like it was a cornerstone of the last Labour government’s on-going reform programme, represented by its 10 year Children’s Plan to make England ‘the best place in the world to grow up’. It remains to be seen whether or not David Cameron’s National Obesity Framework will again elevate the issue as a policy priority in the way that Baroness Benjamin and her colleagues propose, but if Jeremy Corbyn and his team want a big, popular issue around which to unite the parliamentary party and appeal to families across the spectrum, they could do worse than call a child policy review that again takes a serious look at children’s play and its place within the public realm. Adrian Voce OBE is an external member of the All Party Parliamentary Group on a Fit and Healthy Childhood and on the core group of the European Network of Child-Friendly Cities. 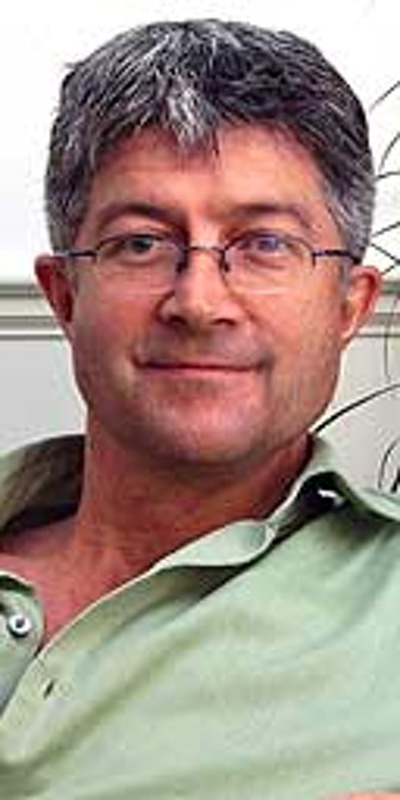 He was the main government advisor on the Play Strategy (2008) and founding director of Play England. 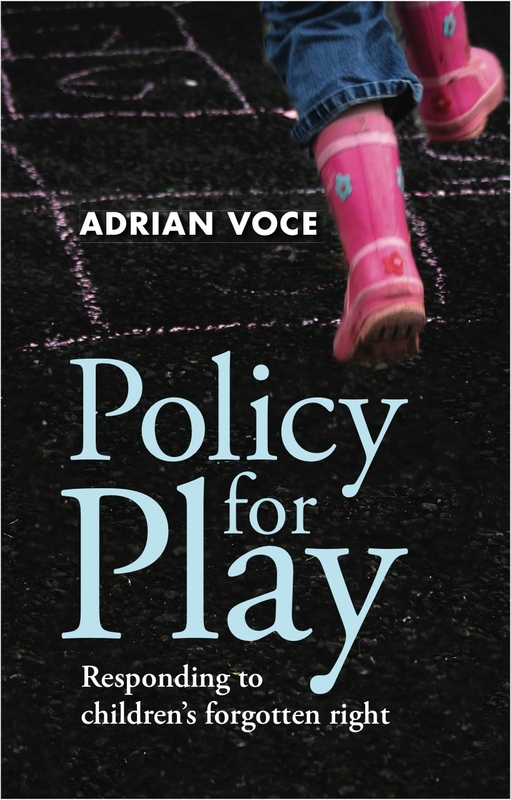 His new book , Policy for Play, is available now. As the New Year gets under way, the seemingly never-ending squeeze on public services, coupled with the perennial under-valuing of children’s play by policy-makers in particular and adult society in general, conspire to paint a gloomy picture for the English play scene in 2016. It is sometimes hard to see past on-going cuts to front line services, the creeping privatisation of provision and the dearth of serious new initiatives to promote and support children’s right to play in the face of the many barriers they continue to face. Will 2016 see growing support for children to play in the streets? Yet, throughout 2015, there were unexpected but welcome signs of growing support for the kind of government play policy that could really make a difference. Fractured as our movement and diminished as our capacity may be as a result of five years of austerity, the challenge of the New Year is to identify these opportunities, formulate a cohesive response to them and coalesce around a plan to turn them into substantive commitments. Here’s how. None of these challenges would be easy in normal times. In the current prolonged period of hugely reduced public spending and the acute scarcity of resources for policy, development and campaigning work, they will be extremely hard to achieve – certainly with anything like the success of the previous decade. It may be that individuals and small groups, each addressing the agenda in their own way and within their own sphere of influence, will be more effective than any kind of national campaign. Over the coming weeks I will discuss each off them in turn and offer my thoughts on how to again secure political commitments to children’s play in England. Follow this site to receive notification of each new blog. On a personal note, 2015 saw more than 11,000 visits to the site: a modest figure by mainstream internet standards, I’m sure, but my most widely read blogging year to date.